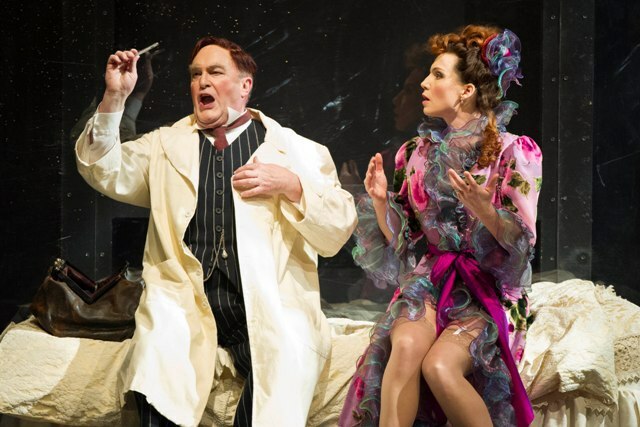 Charming barber Figaro is the focus of the Welsh National Opera's (WNO) Spring season, so much so that this opera opens with a chorus line of huge barber's scissors cavorting elegantly to the opening music. It's a delightful way to get the audience ready for the Barber of Seville and the comedy to come. In fact, it's the accessories in this opera that are the most memorable - the scissor dance, the eccentric clothes and, above all else, the scene-stealing puppet dogs. Rossini's The Barber of Seville is one of a trio of operas in The Forever Figaro Season, which also includes Mozart's The Marriage of Figaro and a new opera by WNO - Figaro Gets A Divorce. I watched the Barber Of Seville on its opening night of the tour at The Millennium Centre in Cardiff, ahead of the WNO visit to Birmingham Hippodrome from March 2 to 5. Australian born baritone Nicholas Lester is a vivacious and charismatic Figaro. He's a strong presence on stage, not just because of his height, but also through his comedic ability to command attention. He makes his entrance through the crowd, giving out business cards, before bursting into song. He's a bright and breezy Figaro who jumps out of grand pianos or climbs balconies, peeping through windows. Director Sam Brown specialises in comedic opera and has made pains to go the extra mile with some modern touches. 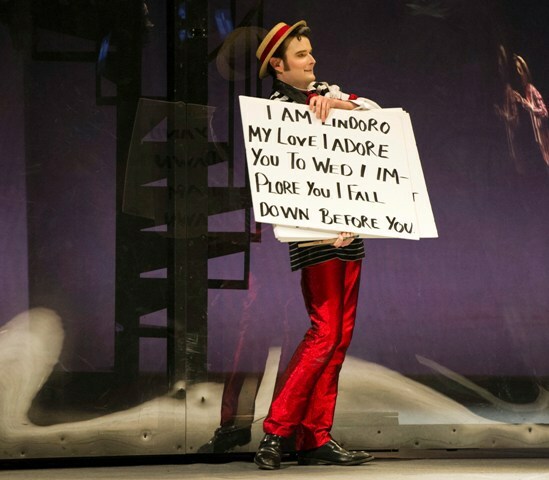 There's even a throwback to the film Love Actually when Figaro holds up huge prompt cards featuring love messages to help out his lovestruck friend Count Almaviva charm Rosina. 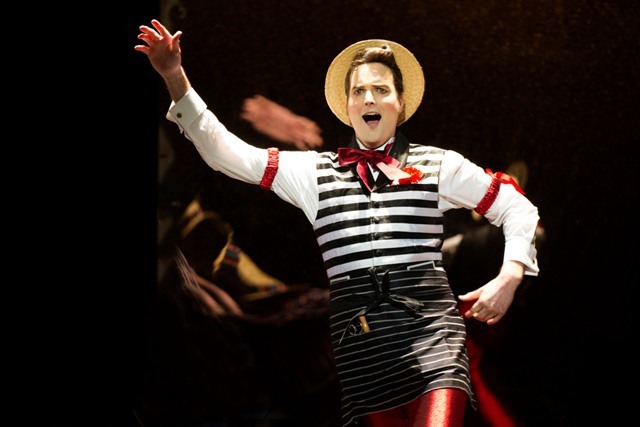 Nicholas Lester is a bright and breezy Figaro in WNO's Barber Of Seville. The story revolves around the popular Barber of Seville - Figaro - who is helping the frustrated Count romance beautiful heiress Rosina. She is kept under lock and key by her guardian Dr Bartolo and only her singing teacher Basilio gets time to visit her - a crazy figure with a tie decorated with piano keys and an adorable puppet dog. Most of the tale is watching the Count, who is also in disguise, desperately try to woo Rosina through various silly escapades with Figaro. He resorts to dressing up as a scout to enter Rosina's home before pretending to be her singing teacher's apprentice, appearing with his own miniature puppet dog and crazy outfit. Andrew Shore as Dr Bartolo and Claire Booth as Rosina in The Barber Of Seville. British soprano Claire Booth is a coquettish and overly sexual Rosina, tormenting her besotted guardian Dr Bartolo in suspenders. Playing Bartolo is Andrew Shore, who fits comfortably in the part - but he did recenty played the same role with English National Opera. While tenor Nico Darmanin is impressive as Count Almaviva with his dreamy voice. He's making his WNO debut and was a finalist in last year's BBC Cardiff Singer of The World. However, despite the strong cast, this is a frustrating production as while it has many hilarious moments of farce and lovely extra touches of detail, it also occasionally loses its momentum and pace. The Barber Of Seville is big on laughs. The stage is made up of revolving clear walls that are constantly turned around and I found myself getting a little annoyed by it. Also, the housekeeper Berta and chef Ambrogio are turned into Benny Hill type over-the-top figures and didn't get the laughs that the director was probably expecting. Sung in English, it makes this opera accessible to more audiences and gives the WNO chance to play around with the words to add to the comedy. It does, however, take away some of the romance of the original opera. This latest production of The Barber Of Seville has many positives and is a bright, colourful spectacle that plays it for laughs. 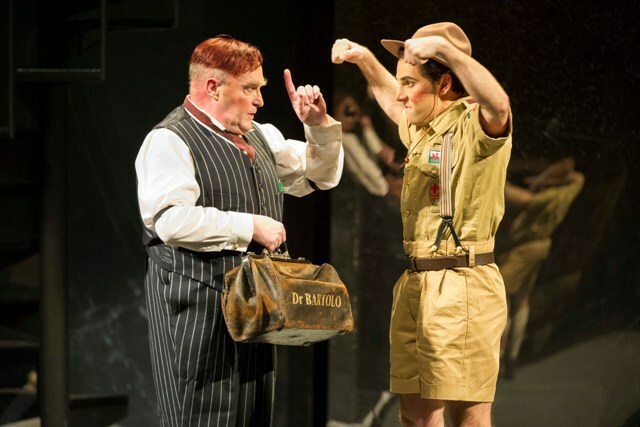 Not one of the WNO's most memorable productions of late, but still enjoyable enough. 2 hours and 50 minutes including an interval. Tickets cost from £16.50 from the Birmingham Hippodrome website.